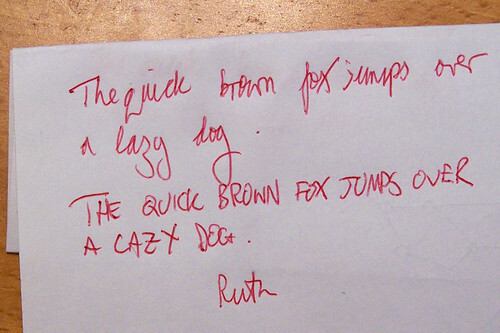 Google’s Deepmind systems are used to recognise handwriting in images. Photo by invisible monsters on Flickr. »Trump’s fans were conned into buying up his debt-laden properties and turning them into a public company. Trump, who plainly had no interest in running a casino and had demonstrated no corporate management skills during the prior decade, paid himself millions of dollars from the company’s coffers for doing essentially nothing. He then unloaded his third casino onto the public company at an inflated price. The public company didn’t show a profit during a single year of its existence. In 2004 the stock was delisted and the company forced into Chapter 11 reorganization. It was renamed Trump Entertainment Resorts, but with Trump still at the helm it continued to pile up losses and amassed debts of nearly $2bn. In 2008, after missing a $53m bond payment, it declared bankruptcy yet again and Trump resigned as the company’s chairman. Its investors lost all their money. In case you’re curious, this is how Trump treats the little people. Just so you can’t say you weren’t warned. Would a President Trump be as corrupt as Berlusconi? Odds seem strong. »We use it to identify text on shopfronts and maybe alert people to a discount that’s available in a particular shop or what the menu says in a given restaurant. We do that with an extremely high level of accuracy today. It’s being used in Local Search and elsewhere across the company. »In 2016, the overall global economy may slow down, and uncertainties such as financial risks in emerging markets are expected to increase. The IT industry will change in an unprecedented speed, and competitions will intensify further. We expect core products of our company, such as smartphone, TV, and memory, will face oversupply issues and intensified price competition. Our competitors will follow close behind our leading position in the global IT industry with aggressive investments and innovations. Moreover, innovative business models such as O2O (Online to Offline) and sharing economy are undermining the importance of hardware, which is our strength, and shifting the core competitiveness to software platform. To cope with these changes in the business environment, we will continue to implement groundbreaking changes and innovations, and strive to secure differentiated competitiveness. “Oversupply issues” probably doesn’t apply to the smartphones, but the price competition will. And there’s no explanation of how it’s going to cope exactly with that shift to software-based competition. »I do not think that because we now have the technology to lock things down (strong encryption) and because the industry that develops and maintains all of this technology has a strong libertarian bent that we should just abandon the framework that has worked in our society for hundreds of years. If society thinks someone is doing something wrong, and if law enforcement can get a warrant, there should be a mechanism to get access to our devices. I would love to see the tech sector work to figure out a smart way to address this issue. My partner Albert has suggested an approach on his blog. There are some interesting approaches that are already being used in cold storage of bitcoin that could be applied to this situation. But my meta point here is that I am saddened by the tech sector’s absolutist approach to this issue. The more interesting and fruitful approach would be to think about the most elegant solutions and build them. »I would posit that each device should ship with an *individual* key that is created by the manufacturer specifically for the purpose of unlocking the device. The key should then be stored in a way where it can be requested by law enforcement (either by the manufacturer or a third party that specializes in compliance for this). The process for such a request should run via the judiciary and mirror that for a warrant. It’s also known as “key escrow” and was part of the “Clipper chip” idea which was proposed by the Clinton administration in the 1990s and comprehensively shown to be a bad idea by Matt Blaze (who is still around, on Twitter and elsewhere). Wilson is the one who was previously stunned by Apple not making iMessage cross-platform, despite the fact that it is demonstrably valuable as an iOS exclusive. I’m approaching the point where I learn what Wilson’s view is on something, and then assume the opposite is what will happen. »Much was made of Microsoft’s move two years ago to start accepting Bitcoin as a form of payment for purchasing content from its online store. The situation has, however, quietly changed, as the computer giant has recently added a note to its website revealing it’s no longer accepting the cryptocurrency in the Microsoft Store on Windows 10 devices. “You can no longer redeem Bitcoin into your Microsoft account,” the message says, though adds that existing balances in user accounts “will still be available for purchases from Microsoft Store, but can’t be refunded.” So to be clear, any funds in your account now are good to use, but forget trying to make any new deposits into your account using Bitcoin. Microsoft accepted Bitcoin? For Windows apps? Doubt that troubled the blockchain very much. »A year ago, Micromax vaulted past Samsung Electronics Co Ltd to become India’s leading smartphone brand. Today, its market share has nearly halved, several top executives have resigned, and the company is looking for growth outside India. In Micromax’s slide to second place is a tale of the promise and peril of India’s booming but hyper-competitive smartphone industry. India is the world’s fastest-growing smartphone market. Shipments of smartphones jumped 29% to 103m units last year. …Last May, Alibaba walked away from a mooted $1.2bn purchase of a 20% stake, citing a lack of clarity on growth plans, according to one executive involved in the discussion. Micromax co-founder Vikas Jain said in an interview with Reuters this week that the company and Alibaba disagreed on a future roadmap. The smartphone business’s evolution has been like the PC business’s evolution speeded up; India’s is like the smartphone one, speeded up again. »The story of how I came to own this forgery isn’t particularly remarkable: In early March, just as the hype around Apple’s new wearable was reaching a fever pitch, I found a Taiwanese seller who claimed to be selling the Apple Watch for immediate shipment. There was no size option or “collection” to choose from, just four colors, so I selected one and placed an order. It cost me the equivalent of roughly $53, and while I knew the watch that eventually arrived wouldn’t be anything impressive, I was nonetheless curious about just how bad it would be. Now I know. Pretty dire. Wonder if they’re any better now? Now in the streaming era all three of those market dynamics have lessened massively. So little wonder then that piracy technology has evolved to meet the needs of the streaming consumer. With YouTube the number one digital music destination, and with a catalogue that no other music service will ever be able to match, it makes complete sense that YouTube rippers have emerged as one of the key strands of music piracy tech. Many of which transform YouTube into a fully offline, on demand, ad free, high quality music service. And that’s why the music labels tend to hate YouTube. »The Guardian has not been agile enough to respond to the challenges faced by the publishing industry over the past few years, according to Guardian Media Group CEO David Pemsel. “I think all those big numbers are a proof point about how fast and innovative we’ve been in getting to digital [but] monetising anonymous reach is essentially over. That conversion of its unknown audience to a known one is a “massive opportunity”, based around a refinement and reinvention of The Guardian’s membership scheme, which Pemsel believes could make up one third of the Guardian’s overall revenue within three years. The point about “monetising anonymous reach is essentially over” is a key one. Pemsel is saying that online advertising in itself isn’t enough to fund the Guardian – which ought to worry everyone else. »Two mathematicians have uncovered a simple, previously unnoticed property of prime numbers — those numbers that are divisible only by 1 and themselves. Prime numbers, it seems, have decided preferences about the final digits of the primes that immediately follow them. Among the first billion prime numbers, for instance, a prime ending in 9 is almost 65 percent more likely to be followed by a prime ending in 1 than another prime ending in 9. In a paper posted online on Sunday, Kannan Soundararajan and Robert Lemke Oliver of Stanford University present both numerical and theoretical evidence that prime numbers repel other would-be primes that end in the same digit, and have varied predilections for being followed by primes ending in the other possible final digits. My first objection on reading those paragraphs was “they should do it in a different number base than decimal”. Then it turns out that they started in a different number base (3) and worked out from there. So yes, this is a spooky property. This entry was posted in links and tagged ai, applewatch, bitcoin, deepmind, google, media, micromax, microsoft, piracy, primes, privacy, samsung, trump by charlesarthur. Bookmark the permalink.